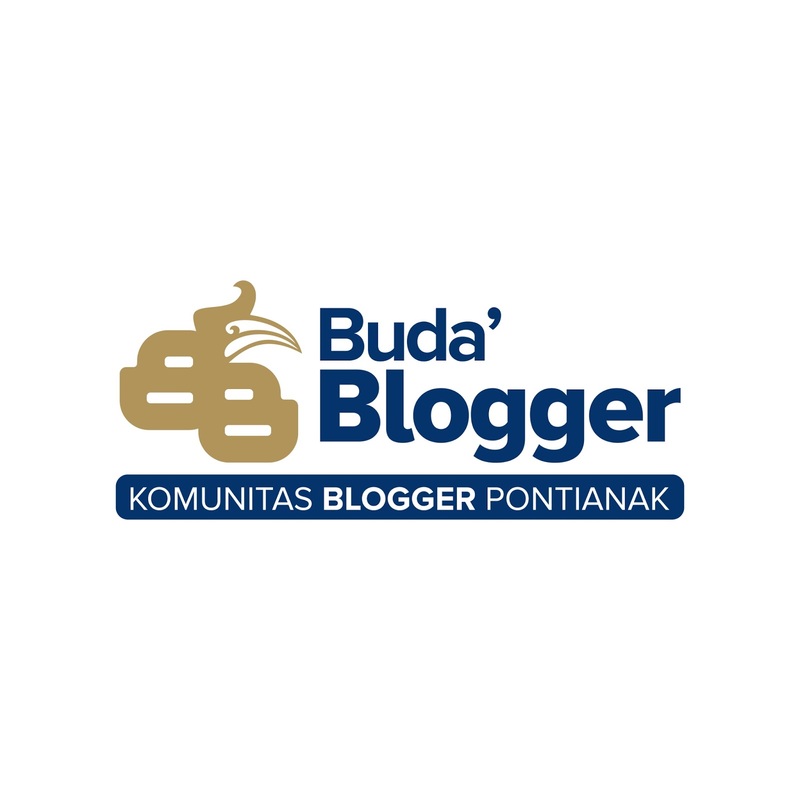 Pontianak. 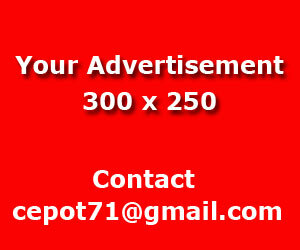 Think before you post is a wise decision before worst can happen to you and other people. 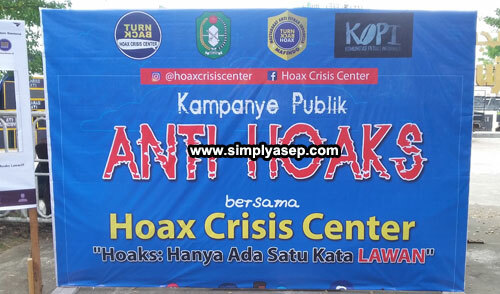 Hoax Crisis Center (HCC) Kalimantan Barat have just launched public campaign against hoax in parking area of Car Free Day around Masjid Raya Mujahidin Pontianak Pontianak from 7 to 10 pm. For those who does not know about HOAX can be explained basically as fake news spread all over social media post instead of midstream ones: newspaper and tabloids As well all know most of internet usage in Indonesia have been committed by young generation called "Millennia" whose daily intentions prefer practical and instant such as facebook, twitter, instagram, and many other social network platforms. The young generations should be given a basic knowledge on how to think before they post, and that is why the Hoax Crisis Center (HCC) Kalimantan Barat is necessary to carry out this public campaign together with other communities in Pontianak with fun and interesting games which became a center of attention by people in the Car Free Day area that morning. The public campaign carried out by the HCC Kalbar have been attended by decision makers, professionals , and public figures including Head of Information And Communication Of West Kalimantan Anthony Sebastian Runtu, Military Command XII Tanjungpura Colonel Aranut Jamaah, Kapendam XII Tanjunpura Lieutenant Colonel Aulia Fahmi Dalimunthe, Head Of Mafindo Pontianak Syarifah Emma Rahmaniah and Head Of Information Care Community Muhammad Ainul Yaqin and other governmental officials. However drizzle is coming down that morning, many people working out and took some morning exercises around the Car Free Day area were also watching and viewing the campaign enthusiastically. This can be seen by some of passer by were asked by two awesome Master Of Ceremony (MC), Susi Carol and Ipunk Wahaha, in order to get fabulous goodies bad and prizes. "The final result of the contest will be announced in Tuesday or Wednesday next week, so you don't have to post your photo contest today" said Susi Carol with her megaphone among her hands. 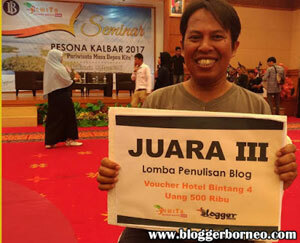 The winner will be announced by the panel judges from the Hoac Crisis Center (HCC) Kalbar and journalist. 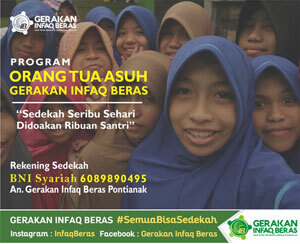 Susi Carol said the criteria of the photo submitted is not only a selfie position but all areas around the photo booth or the area of the campaign by considerations as assessments such as the number of LIKES. 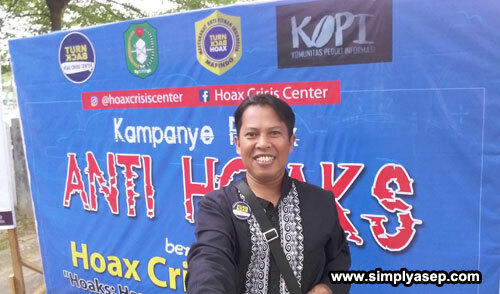 Its me on the location during campaign against hoax launched by Hoax Crisis Center (HCC) Kalbar at Car Free Day zone on Sunday (22/7).